How do I use Expert Mode on my Samsung Galaxy Camera? Your Samsung Galaxy Camera provides you with an Expert mode or manual mode for capturing images with the fine-settings tweaks that are needed from time to time. If you cannot capture the photo with the result you want using Auto mode or Smart modes, you can try using the Expert mode. Open the camera app, and touch Mode > Expert. Full Manual: All camera settings, except exposure value, can be adjusted separately. Program: Use this option to manually set ISO sensitivity or exposure value (EV). The shutter speed and aperture will be set automatically. Aperture Priority: Use this option to manually set the aperture level. Shutter speed will be set automatically by the camera. Speed Priority: Use this option to manually set the shutter speed. Aperture level will be set automatically. Manual Camcorder: Use this option to open up all of the camcorder options available on your camera. When selected, all movie sizes and frame rates will be available from the settings menu. Adjust the selected settings as desired by touching and sliding your finger up or down on the setting ring. When you have adjusted the settings as needed, touch the selected mode icon again to save the settings and return to the viewfinder. Point the camera at the scene, touch an area of the scene to set the focal point, or center the focal point on the desired area and partially depress Shutter button. Wait for the focal point to turn green and then fully depress Shutter button. Shutter speed: Set the effective time that the shutter is open when you capture a photo. Your camera supports a range of 1/2000 up to 16. Aperture: Increase or decrease the opening of the camera lens. Decreasing the number increases the size of the opening. 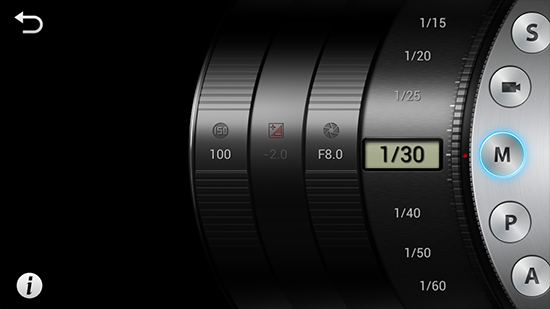 Your camera supports values of F8.0, F7.1, F6.3, F5.6, F5.0, F4.5, F4.0, F3.5, F3.2, and F2.8. EV: The exposure value is achieved through a combination of the shutter speed and aperture. You can adjust the EV when you select Aperture Priority, Speed Priority, and Program mode. You can select values from -2.0 to +2.0. ISO: Sets the sensitivity level of the camera's sensor to a level equivalent to the sensitivity of camera film. Your camera supports ISO levels from Auto, and 100, 200, 400, 800, 1600, and 3200.